I would love to smoke things but I don’t have a smoker and each time I suggest to Dave that I turn my electric frying pan into one, he kind of ignores me. I do not use my electric frying pan at all. It was one of the first kitchen utensils I purchased and it was used originally to make paella in – now I have a proper paella dish. If it was not being used for paella, it was used for prawns. We would sit at the breakfast nook and cook and eat and eat and cook so that we always had a pile of freshly cooked, hot prawns to devour. Now I have a gas burner on my butcher’s block which can be moved to the table for that job. So, for about 4 years the electric frying pan has been languishing under the bunk beds in what is my hidden storage place – the one for things I might need one day! I took the electric frying pan out of the box and put it under the bed as my friend Sonja wanted it. But she has never fetched it, and the last time I looked, she had bought a new one for herself. So, as I don’t have a smoker and Dave does not seem to want to help me turn my electric frying pan into one, I used smoked salt and smoked paprika to ‘smoke’ my marrow bones. Marrow bones are a cheap off cut of meat and this meal cost us R20 (€2) and was an absolute bargain! A perfect warming meal for the cold winter nights we are still experiencing here in the Western Cape. Do you like to smoke food? I am submitting this recipe to Presto Pasta Nights, which is being hosted this week by Val of More Than Burnt Toast. Tandy – this is both unusual and intriguing. Thanks for linking it in. Have a good week. Ooh that must have tasted good!! I know it’s odd but I like very little smoked food. Occasionally a piece of smoked salmon is ok but really I prefer it “regular”. I am however, going to make this recipe. I have some of those bones in the fridge and I had no idea what to do with them. Thanks for this idea. My sister had a sauce with bone marrow in it that was ladled on top of steak. This pasta sounds delicious with it. I love the elegance of this dish. I used to eat bone marrow as a child, not knowing what it was but that it was delicious—I like your method of preparation and will surely serve it this way soon!!! Fantastic Tandy! I love marrow bones, but I do not have idea where to buy them here in London????!!! Back home in Rome my mum cooks a dish called ossobuchi and the bone marrow is the best part!! I love the idea of combining this sauce with pasta. You got me google the marrow bones! I have never heard of them but I always love to try new flavors! I’ve never tried bone marrow.. but this recipe makes me braver to try! I don’t have a smoker either.. I hope you get one soon, Tandy!! 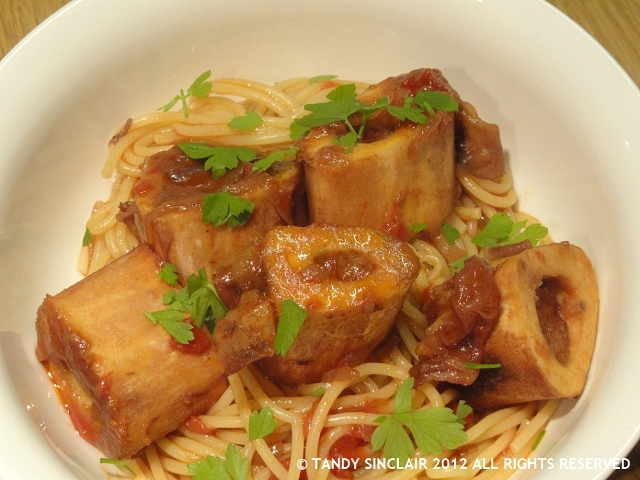 Oh wow Tandy – I adore marrow bone and this looks amazing. Love the idea of the smoked paprika, a current favourite! You will love the two together then! I use smoked paprika to smoke food also! Or at least to pretend to. 😛 It does a pretty good job of mimicking the flavor! What a great idea! Thanks for sharing with Presto Pasta Nights. My OH would LOVE that dish. I am a bit of a wimp when it comes to bone marrow myself but that dish does look good. Have you seen those smoking guns, Tandy? You put what ever you want to smoke in a bag and the gun cold smokes it. I went on a charcuterie course at Bread and Wine and they were using one and it was the best gadget ever. I bet your Dave wouldn’t be able to resist that. It’s a real boy’s toy! Hideously expensive though. But I will treat myself. One day. oh my, I have to find one of those – off to yuppiechef I go! that would be good LOL! maybe find a good butcher to cut the bones in half and then you can roast them and scrape the marrow out?